Hello! I am coming to you from the other side of Thanksgiving. I hope yours was wonderful. Our celebration felt very festive because we had some guests -- enough guests that we could set up a puzzle. I think that's the measure of a holiday gathering in my mind. "Are there enough people here that we could set up a puzzle and someone would always be working on it, even if people are coming and going?" Anyway, I wanted to give you an update on the Cybils! Things are going swimmingly. At least, I'm enjoying myself. I've read 20 nominees so far, and hope to read many many more of the 107 on the list. We're reading everything from Pokemon Omega Ruby Alpha Sapphire, Vol. 1 to Rolling Blackouts: Dispatches from Turkey, Syria, and Iraq . Everything from Noodlehead Nightmares to Neil Gaiman's How to Talk to Girls at Parties . It is really a vast range and I'm thankful that we get to pick two shortlists, one for ages 13+ and one for ages 5-13. We'll narrow down the 56 Elementary & Middle Grade nominees to a list of 5-7 top titles, and hand those to next round's judges. Same story for the 51 Young Adult nominees. It's fun to read all the books of course, even the ones that don't turn out to be gold, I'm glad I've read them. It's fun to get a bunch of books in the mail, when publishers are able to send copies. 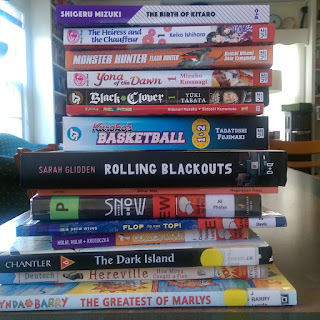 It's fun to go to the library and have a giant stack of titles waiting for you. 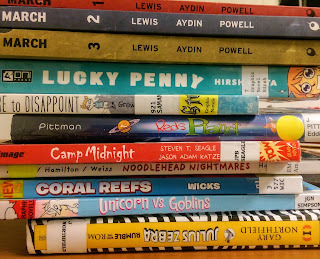 It's fun to check them off the reading list (we have a Cybils database we have to keep up to date). And it's fun to discuss the books with other panelists. The other panelists I'm working with this year are Lexie who publishes lots of reviews from a wide variety of genres at For the Sake of Reading, Amy who contributes to No Flying No Tights and isn't the only one there writing about graphic novels, Benedict Hutchinson who blogs easy-to-read reviews between his high school classes at A Goblin Reviews Graphic Novels, and Liz Jones at Lizjonesbooks, who is our category organizer. 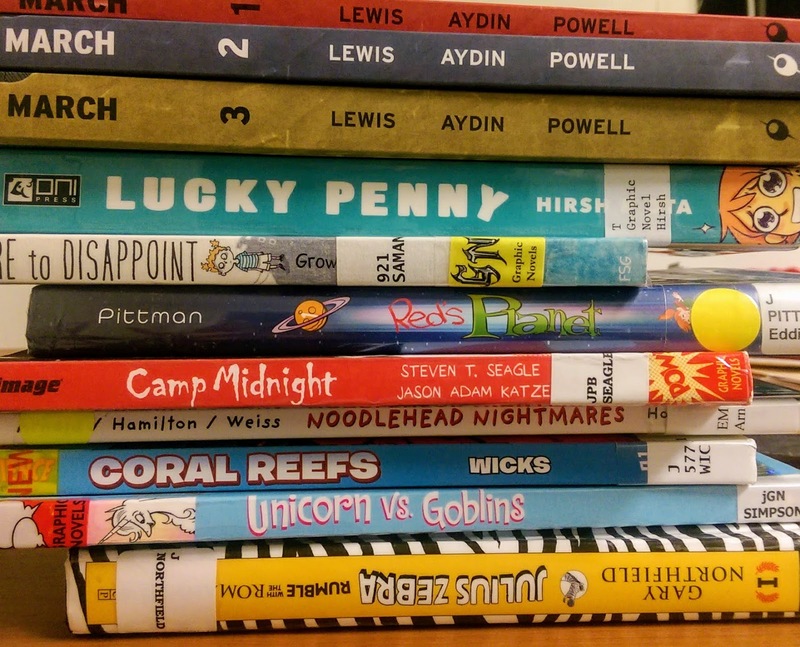 All of us judges work to pick the best quality literature that is also highly interesting to kids -- the Cybils criteria are 1) literary merit and 2) kid appeal. Ok, now I'm off to read! But before I begin I'd love to hear what you're reading these days. Leave me a comment. And if you have any questions about the Cybils, I'd be happy to answer! How do we find out what was nominated again?